It's no surprise that I have weddings on the brain right now. With my impending wedding just around the corner I eat, sleep, and yes sadly, dream weddings these days. The inspiration for this collection came from this M necklace (my soon to be last name begins with M). I love all those blues...it is my favorite color...my mom was suprised when I went with pink.I think you should have centerpieces in those blue ball jars! That's what I was thinking too, I love the blue ball jars! 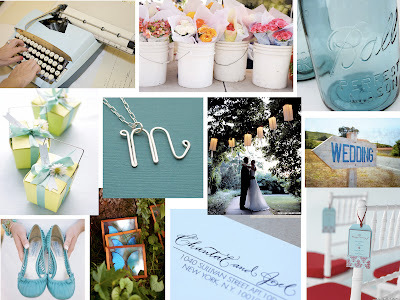 One of the most important aspects of a wedding is the color scheme of the event. I really love blue and that color works well in any season.